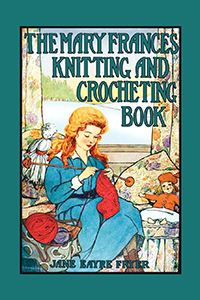 This wonderfully illustrated book tells the story of Mary Frances, a little girl who learns all sorts of things from The Knitting People, fairy helpers who live in her house and surprise her with some delightful lessons on knitting and crocheting. They are such good lessons that almost before she knows it, Mary Frances has made the loveliest hats and sweaters and socks for her dolls. This classic is part of the Mary Frances Books for Children, a collection of children's instructional craft books, all of which were originally published in the early 1900s. For ages 9-12.